A Talk Given at St Nicholas Russian Orthodox Church in Oxford on 23 March 2013 after the Memorial Service at Archimandrite Nicholas’ Grave in Headington Cemetery. 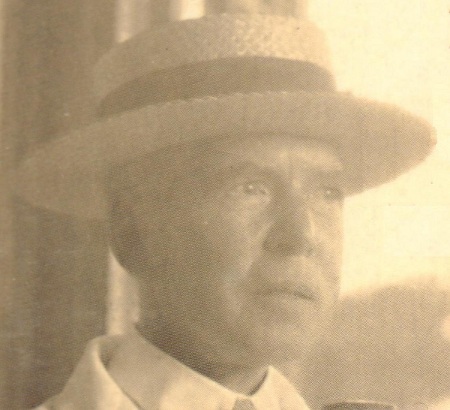 Charles Sydney Gibbes, for short Sydney Gibbes, was born 137 years ago, on 19 January 1876. In the 19th century this was the feast day of St John the Baptist, the voice that cried in the wilderness. His parents were called John and Mary – more English than that you cannot find. His father was a bank manager in Rotherham, just outside Sheffield, in Yorkshire. Amusingly, this would later be recorded by a Russian civil servant on Sydney’s residence papers in Russia as ‘Rotterdam’. With no fewer than ten siblings, Sydney grew up into a stereotypical, Victorian, Protestant young man of the educated classes. He received this education at Cambridge, where he changed the spelling of his surname to Gibbes, from Gibbs, as the adopted form is the older, historical one. This change was typical of his love of detail and historical accuracy. Sydney is described as: severe, stiff, self-restrained, imperturbable, quiet, gentlemanly, cultured, pleasant, practical, brave, loyal, honourable, reliable, impeccably clean, with high character, of good sense and with agreeable manners. e 2wasHe seems the perfect Victorian gentleman – not a man with a vision. However, as we know from history, underneath Victorian gentlemen lurked other sides – repressed, but still present. For example, we know that he could be stubborn, that he used corporal punishment freely, that he could be very awkward with others, almost autistic, as we might say today, and he is recorded as having quite a temper, though these traits mellowed greatly with the years. Dmitri Kornhardt recalled how in later life tears would stream down Fr Nicholas’ face when conducting services in memory of the Imperial Martyrs, but how also he would very rapidly recover himself after such unEnglish betrayals of emotion. Underneath the Victorian reserve there was indeed a hidden man, one with spiritual sensitivity, who was not indifferent to ladies and interested in theatre and theatricals, spiritualism, fortune-telling and palmistry, and one who was much prone to recording his dreams. Perhaps this is why, when after University he had been thinking of the Anglican priesthood as a career, he had found it ‘stuffy’ and abandoned that path. Talking to those who knew him and reading his biographies, and there are three of them, we cannot help feeling that as a young man Sydney was searching for something – but he knew not what. The real man would out from beneath his Victorian conditioning. Perhaps this is why in 1901, aged 25, he found himself teaching English in Russia – a country with which he had no connection. Here he was to spend over 17 years. The key moment came in autumn 1908 when he went to the Imperial Palace in Tsarskoe Selo and became the English tutor of the Imperial children. In particular, he became close to the Tsarevich Alexis, with whom he identified very closely. Why? We can only speculate that there was a sympathy or else complementarity of characters; together with Sydney’s bachelordom, this may have been enough for the friendship to develop. In any case, he became almost a member of the Imperial Family and their profound and lifelong admirer of their exemplary Christian Faith and kindness. In August 1917 Sydney found himself following the Family to Tobolsk. Utterly loyal to the Family, in July 1918 he found himself in Ekaterinburg, after the unimaginable crime in the Ipatiev House had taken place. He helped identify objects, returning again and again to the House, picking up mementoes, which he was to cling on to until the end, and still reluctant to believe that the crime had taken place. Coming almost half way through his life when he was aged 42, this was without doubt the crucial event in that life, the turning point, the spark that made him seek out his destiny in all seriousness. With the murder of the Family, the bottom had fallen out of his life, his raison d’etre had gone. Where could he go from here? He did not, like most, return to England. We know that he, like Tsar Nicholas, had been particularly shocked by what he saw as the British betrayal of the Imperial Family. Indeed, we know that it was the scheming Buchanan, the British ambassador to St Petersburg, who had been behind the February 1917 Revolution and deposition of the Tsar. This had been much greeted by the treacherous Lloyd George as the ‘achievement of one of our war aims’. (We now also know that it had been British spies who had assassinated Rasputin and also that the Tsar’s own cousin, George V, had refused to help the Tsar and His Family escape). In fact, disaffected by Britain’s politics, from Ekaterinburg Sydney went east – to Siberian Omsk and then further east, to Beijing and then Harbin. Off and on he would spend another 17 years here, in Russian China, Manchuria. In about 1922 he suffered a serious illness. His religiosity seems to have grown further and after this he would go to study for the Anglican priesthood at St Stephen’s House in Oxford. However, for someone with the world-changing experience he had had, that was not his way; perhaps he still found Anglicanism ‘stuffy’. Finally, in 1934, in Harbin, he joined the Russian Orthodox Church. There is no doubt that he did this as a direct result of the example of the Imperial Family, for he took the Orthodox name of Alexis – the name of the Tsarevich. He was to describe this act as like ‘getting home after a long journey’, words which perhaps describe the reception into the Orthodox Church of any Western person. Thus, from England, to Russia and then to China, he had found his way. In December 1934, aged almost 59, he became successively monk, deacon and priest. He was now to be known as Fr Nicholas – a name deliberately taken in honour of Tsar Nicholas. In 1935 he was made Abbot by Metr Antony of Kiev, the head of the Church Outside Russia and later he received the title of Archimandrite. Wishing to establish some ‘Anglo-Orthodox organisation’, in 1937 Fr Nicholas Gibbes came back to live in England permanently. He was aged 61. Of this move he wrote: ‘It is my earnest hope that the Anglican Church should put itself right with the Holy Orthodox Church’. He went to live in London in the hope of setting up an English-language parish. In this he did not succeed and in 1940 he moved to Oxford. In this last part of his life in Oxford, as some here remember, he became the founder of the first local Russian Orthodox chapel at 4, Marston Street, where he lived in humble and modest circumstances. In recalling the address of that first chapel dedicated to St Nicholas, we cannot help recalling that today’s St Nicholas church, where we speak, is off Marston Road, and not so very far away from Marston Street. Not an organiser, sometimes rather erratic, even eccentric, Fr Nicholas was not perhaps an ideal parish priest, but he was sincere and well-respected. In Oxford he cherished the mementoes of the Imperial Family to the end. Before he departed this life, on 24 March 1963, an icon given to him by the Imperial Family, was miraculously renewed and began to shine. One who knew him at the time confirmed this and after Fr Nicholas’ death, commented that now at last Fr Nicholas was seeing the Imperial Family again – for he had been waiting for this moment for 45 years. He was going to meet once more those who had shaped his destiny in this world. In the 1980s I met in an old people’s home in Paris Count Komstadius. He had met Fr Nicholas in 1954, but perhaps had seen him before, since his father had been in charge of the Tsarskoe Selo estate and he himself had been a childhood friend of the Tsarevich. I remember in the 1980s visiting him. In the corner of his room in front of an icon of the martyred Tsarevich there burned an icon-lamp. He turned to me and said: ‘That is such a good icon, it is just like him and yet also it is an icon’. Not many of us lives to see a childhood playfriend become a saint and have his icon painted. Yet as a young man in his thirties Fr Nicholas had known a whole family, whom he considered to be saints. Indeed, he had been converted by their example. There are those who have life-changing experiences. They are fortunate, because they stop living superficially, stop drifting through life and stop wasting God-sent opportunities. Such life-changing experiences can become a blessing if we allow them to become so. Fr Nicholas was one such person, only his life-changing experience was also one that had changed the history of the whole world. For a provincial Victorian Yorkshire bank manager’s son, who had grown up with his parents John and Mary, he had come very far. And yet surely the seeds had been there from the beginning. To be converted we first of all need spiritual sensitivity, a seeking spirit, but secondly we also need an example. Fr Nicholas had had both, the example being the Imperial Martyrs. As the late Princess Koutaissova, whom many of us knew, said of his priesthood: ‘He was following his faithfulness to the Imperial Family’. In this brief talk I have not mentioned many aspects of Fr Nicholas’ life, such as his possible engagement, his adopted son, his hopes in Oxford. This is because they do not interest me much here. I have tried to focus on the essentials, on the spiritual meaning of his life. Those essentials are, I believe, to be found in his haunted and haunting gaze. Looking at his so expressive face, we see a man staring into the distance, focusing on some vision, both of the past and of the future. This vision was surely of the past life he had shared with the martyred Imperial Family and also of the future – his long hoped-for meeting with them once more, his ‘sense of completion’. To the Ever-memorable Archimandrite Nicholas: Eternal Memory! This entry was posted in Russia, The Romanovs and tagged Charles Gibbes, Ekaterinburg, Romanovs on March 24, 2013 by oeadmin. The above poster has appeared on billboards in the Ukraine in recent days. It says: Orthodoxy. Sovereignty. The People. Our ancestors lived according to their conscience. What about us? 1613-2013. 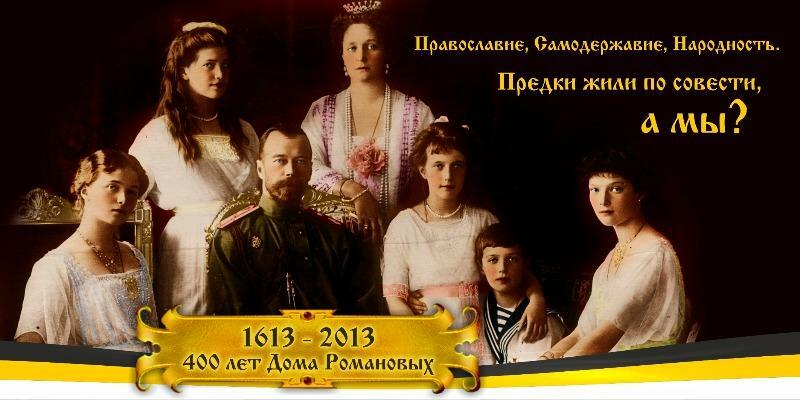 400 years of the House of Romanov. According to opinion polls of recent years between 25% and 35% of Russians would like to see the return of the monarchy. However, no-one knows of a suitable candidate. This entry was posted in Europe, Russia, The Romanovs and tagged billboard, Romanovs, Ukraine on March 24, 2013 by Father Andrew. The election yesterday of a new Pope of Rome has called forth various reactions, those of the cynical and those of the optimists. What are those reactions? Cynics say that the whole event is a PR stunt. The embattled cardinals have chosen a weak front man, who has taken the sentimental name of Francis as Pope. The image he will project is of a humble and poor monk. In reality, so they say, this represents no change; whatever his real personality, the same people will run the show from behind the scenes. They point to the fact that, at the age of 76, Francis I appears to be another stop-gap Pope. Although not officially Italian, he was born of Italian parents in Argentina, the most Italian part of South America, where even the Spanish is Italian. They see in him just another Italian or, at least, semi-Italian, bureaucrat. Finally, the cynics see in this Jesuit (a word that is a synonym for scheming and cunning, one for whom ‘the ends justifies the means’) a man who compromised himself with the tyrannical Argentinian junta of some 35 years ago. Orthodox will note that Francis I was in charge of ‘Eastern Catholics’ in Argentina and recall the cruelty of the Jesuits who operated Uniatism in Eastern Europe. Optimists will be appalled at such cynicism. Giving him the benefit of any doubt there may be, they see in the new Pope a sincere, pious, humble man of orthodox faith, who knows how to communicate with simple people. For them, he is a pastor who shares and understands the life of the people, like the average Orthodox priest, traditional in teaching but liberal in social matters and justice. They see in him not a theoretical academic, but a realist. His age, they might say, proves it. Here is a man of experience, the very experience that is necessary to reform and cleanse the Vatican from its infernal, self-justifying and corrupt bureaucracy. Surely he is intelligent and practical enough to know how to delegate and manage people. In the new Pope they see the opportunity for Roman Catholicism to return to the essentials. Perhaps he will turn the Vatican, with its indecent frescoes, into a giant Renaissance museum. Tourists could be charged to enter and the money collected given to the Catholic poor of the Third World. Meanwhile, the Church could transfer its centre to one of the early churches of the Rome of the first millennium. With time we will see who is right, the pessimists or the optimists. For our part, we are reminded of the words of the first English Orthodox priest of the last century, Fr Nicholas Gibbes, who in 1934 described embracing Orthodoxy as ‘like getting home after a long journey’. The Roman Catholic world has been on a very, very, very long journey. It is our hope, however small, that the new Pope might understand this. This entry was posted in Catholicism and tagged Repentance, The Papacy on March 14, 2013 by Father Andrew. Presumably, the next Pope will be elected from among the 115 cardinals now in conclave in Rome. Of course, it is also possible that they could break with some 750 years of custom and elect one who is outside their college. That would be acceptable, although highly surprising. As regards who will be elected, nobody knows and it is a waste of time speculating. Obviously, Orthodox will not be consulted about the election, but we might think what general type of man we would like to be elected. Firstly, we would like to see a man of faith, and not some swim-with-the-secular-tide conformist. This might suggest an African, or at least someone who is not from Europe. Normally, a man of faith would automatically have some sort of charisma, or presence, which he could express and communicate – that is essential. Thus, the future Pope should not look like an elderly and dreary Vatican bureaucrat, as so many cardinals appear to. Secondly, it is clear that Roman Catholicism needs to be managed, which rather excludes the ivory tower intellectual, academic, teacher type, represented by the last Pope. However, a manager does not at all mean that the next Pope should be an accountant/administrator with an MBA. That would be a disaster. What is needed is someone who knows how to delegate the necessary management to the right people, so that he is left to perform his main task – praying. Thirdly, Roman Catholicism surely needs someone who can distinguish between the ‘primaries’ of the Faith and the ‘secondaries’. The primaries are the Church Tradition, teachings established in the First Millennium, the secondaries are those inessential customs that replaced primaries, or else were added on to it, in the Second Millennium. The primaries include all the dogmas and teachings of the fourth century Creed, purified from the filioque deformation first confessed in Rome in 1014, nearly 1,000 years ago. They also include a sacramental attitude to the world, a male priesthood and the Biblical, Apostolic and Patristic attitude to homosexuality. The secondaries include the introduction of such temporary and pernicious customs as priestly celibacy, which has helped to lead to sexual perversion, or the dogmatic attitude to contraception that makes almost all married Catholics into hypocrites. This also means putting back what has been taken away in the Second Millennium, restoring the original understanding of the Holy Spirit, the Mother of God, the Saints, holiness, the Church as the image of the Holy Trinity, unity in diversity, the role of the Local Church and the episcopate, the sense of the mystical and the sacred. The above three qualities, a prayerful faith communicated through charisma, the ability to delegate management to the right people, and the ability to return to the essentials of the Christian Faith, rid of the deformations of the Second Millennium, may not be found in any of the 115 cardinals. In that case, it would be time to look outside their college. The right choice is vital – because Roman Catholicism now faces a test of survival. Either it can go the whole way and become fully secularised like most of the Protestant world, as it threatens to do, or else it can return through repentance to the Church and Orthodoxy, which it so short-sightedly abandoned a whole millennium ago. It is make or break time. May God’s will be done. This entry was posted in Catholicism, Church Unity, Clerical Celibacy, Filioque, The Future and tagged The Papacy on March 12, 2013 by Father Andrew. On Friday 8 March the Paris Rue Daru administration admitted that in Constantinople Patriarch Bartholomew had rejected the list of three candidates selected as the next possible Archbishop of the Rue Daru grouping. The locum tenens, or temporary head, of the grouping, Metropolitan Emmanuel of the Greek Archdiocese in France, stated that the Patriarch had decided that the situation in Paris was ‘too unsettled for elections to take place’. For this reason Metropolitan Emmanuel will continue in his present capacity. However, it was also stated that a candidate to become a vicar-bishop for the Rue Daru grouping could be appointed under Metropolitan Emmanuel. We wonder if this does not mean that the Patriarchate of Constantinople will not at last, from its point of view, regularise the uncanonical situation of the Rue Daru grouping. Until now there have been two bishops of the same Constantinople jurisdiction in Paris, the head of the Greek Archdiocese and the head of the Rue Daru Archdiocese. By putting the tiny Rue Daru grouping into a vicariate under the Greek Metropolitan, this problem could at last be resolved. As was suggested by the Patriarchate two years ago, those parts of the Rue Daru grouping which are outside France, for example in Great Britain, could simply be transferred to the local Greek jurisdiction. With the anti-monastic history of the Rue Daru grouping, it was inevitable that one day there would no longer be any monks suitable to become Archbishop. And with this in mind, it was also inevitable that one day the Rue Daru grouping would be forced into becoming an integral part of the Greek Patriarchate of Constantinople. This process has been under way for nearly fifty years, with ever increasing numbers of its communities adopting the ‘Greek’ (= Catholic) calendar and modernistic Greek liturgical customs and dress. Indeed the same process has been under way in the tiny Carpatho-Russian grouping in North America, called ACROD, which last year was also forced into accepting a Greek head. It is increasingly clear (to some of us it had already become crystal clear in the 1980s) that the only alternative to this scenario of Hellenisation and assimilation is to return to the Russian Mother-Church. With 829 parishes, 52 monasteries and 20 bishops in 57 countries outside Russia, the reunited Mother-Church could easily re-integrate the elements of the Rue Daru grouping which wish to remain loyal to the Russian Orthodox Tradition. It remains unclear, however, if this obvious solution to its crisis is the path that any in the Rue Daru grouping will take. This seems all the more extraordinary when most who attend services at the Rue Daru Cathedral are actually recent immigrants from the former Soviet Union. This entry was posted in Constantinople, Schism, The Diaspora and tagged Rue Daru on March 11, 2013 by Father Andrew. Twenty-five years ago the Russian Orthodox Lands, ‘Rus’, for short, commemorated the millennium of their Baptism. At that time there began the great spiritual revival that has continued since. A generation on, in 2013, we can see how far things have moved on. The period of the abhorrent Gorbachev, who destroyed tens of millions of lives, that of the ephemeral gerontocrats before him, the period before that of Brezhnevian stagnation, and before that of the ignoramus and atheist fanatic Khrushchev, have been rejected, seen for what they were. That part of recent history has been rejected and even reversed, but the Russian Lands have still not worked their way through the Stalinist period before them. The recent debate in Russia about the role of Stalin in history, sparked by the 70th anniversary of Stalingrad, is indicative of this. Opposed to those who see Stalin as a forerunner of Antichrist, there are nationalists who, blinded by their nationalism, see him as a great leader. They fail to see that it was not Stalin who won the War; it was the peoples whom he oppressed who won the War and so saved the West from Fascism. This proves that Stalin has not yet been exorcised from the national psyche. And it is only once he has been exorcised that the final barrier to full resurrection can be overcome. That final barrier is Lenin, whose mummy still lies in mockery by the Kremlin walls, and the thousands of statues, streets and places which still commemorate that demon and his fellow fiends. The Russian Lands are still on a knife-edge. They can still choose to go downwards ever further into the spiral of corruption and degeneration, abortion and alcoholism, emigration in despair and the ever-growing demographic crisis. The mineral wealth of Rus, like its oil, gas, metals and timber also, are not for oligarchs to buy villas and mansions and waste their substance like the prodigal in London and Tel-Aviv, in New York and Paris, in Nicosia and Bangkok. That mineral wealth was destined by God to build churches in the Russian Lands, in Russian America (Alaska) and the English and Latin Americas, in Europe and Africa, in Asia and Oceania. The fortune of only one of these oligarchs would be enough. Others could pay for decent housing for Russian families, so that the young would not be afraid to have and bring up large families. The vast steppes of the Ukraine and Russia, before the First World War the breadbasket of Western Europe, were also given by God. They are not to be deserted and depopulated, left fallow, so that the Russian Lands have themselves to import grain. They are there to feed the world. If there is no mass repentance, no return to the only true ideology of Rus, Orthodoxy, Sovereignty and the People, then the Russian Lands will be lost and broken up. Siberia will be occupied by the USA, China and Japan, which will ruthlessly strip it of its resources. Belarus will become a province of Poland. Georgia and the Ukraine will become more EU/NATO colonies, new Kosovos. And European Russia will be divided into various provinces on a divide and rule basis, in other words it will be Yugoslavised. As for the Russian Orthodox Church, it will be Constantinopolised and Antiochised, subjugated to the humiliation of not even being able to use its own calendar, the calendar of the saints and Fathers. And Air Force One will drop off the new puppet-Patriarch from the USA, the Orthodox Patriarch himself deposed and exiled, just like Patriarch Maximos V of Constantinople in 1948. However, there is an alternative, but only one alternative. If mass repentance does take place, alcoholism, abortion and corruption ceasing with it, then Orthodox Rus can be restored. If there is mass repentance and the spiritual level does rise, then inevitably the Monarchy will be restored. This Tsar, perhaps the last before Antichrist, will be ‘what is restraining him now’ (2 Thess 2, 6). This Tsar will hold back the tide of evil that is now sweeping through the world. Anointed by the Church, he will restore the Church worldwide. To most, such a hope seems unlikely. We will agree that given the current state of the Russian Lands, humanly speaking, this all seems quite impossible. However, given the changes that we have seen since 1988, we cannot exclude the grace of God from the destiny of the Russian Lands, from the possible fulfilment of Orthodox Rus, of Holy Rus, of the light before the end. This entry was posted in Orthodox Restoration, The Romanovs and tagged Restoration, Salvation on March 10, 2013 by Father Andrew. On 6 March, the 400th anniversary of the election of Michael Feodorovich Romanov to be Tsar, His Holiness Patriarch Kyrill of Moscow and all the Russias celebrated the Divine Liturgy in the Patriarchal Cathedral of the Dormition in the Moscow Kremlin. Concelebrating with His Holiness were: Metropolitan Hilarion of Volokolamsk, Chairman of the Church’s External Relations Department; Archbishop Mark of Egorievsk, Head of the Department for Foreign Institutions of the Moscow Patriarchate; Bishop Agapit of Stuttgart; Bishop Theophylact of Dmitrov; Bishop Ignaty of Bronnitsy, Chairman of the Synodal Department for Youth Affairs; Bishop Sergy of Solnechnogorsk, Head of the Secretariat of the Moscow Patriarchate; Bishop Panteleimon of Smolensk and Vyazma, Chairman of the Synodal Department for Church Charities and Social Services; Archpriest Vladimir Divakov, Secretary of the Patriarch of Moscow and all the Russias for the City of Moscow; Archimandrite Tihon (Shevkunov), Superior of the Stavropegic Sretensky Monastery; Archimandrite Savva (Tutunov), Deputy Chancellor of the Moscow Patriarchate; Archpriest Vsevolod Chaplin, Head of the Synodal Department for Relations between Church and Society; Archpriest Vladimir Siloviev, Head of the Moscow Patriarchal Publishing House; Archpriest Michael Riazantsev, Priest in Charge of the Cathedral Church of Christ the Saviour; Archpriest Alexander Dasaiev, Dean of the Voskresensky District of Moscow; Archpriest Anatoly Kozha, Dean of the Paraskevo-Piatnitsky District of Moscow; Archpriest Anatoly Rodionov, Dean of the Vlahernsky District of Moscow; Archpriest Oleg Korytko, Head of the Review Department of the Moscow Patriarchate; Hieromonk Nikon (Belavenets) and other clerics of the City of Moscow. Also present at the service were: the Head of the Russian Imperial House Grand Duchess Maria Vladimirovna, the great-great-grandson of Emperor Alexander III, P.E. Kulikovsky, the Chairman of the Association of Russian Nobility, Prince G. G. Gagarin, and the Deputy Chairman of the State Duma Committee of the Russian Federation for Public Associations and Religious Organizations, M.Y. Markelov. The Moscow Synodal choir, led by Alexei Puzakov, and the choir of the Academy of Choral Arts, led by Alexei Petrov, sang at the service. Archpriest Artemy Vladimirov, the Rector of All Saints Church in Krasnoye Selo in Moscow, gave a sermon before communion. At the Liturgy prayers were said ‘for the eternal repose of the souls of the departed servants of God, the ever-memorable rulers of Holy Rus, faithful Princes and Princesses, Tsars and Tsarinas, and all who were in authority and with diligence cared for the purity of the faith and ruled our land in the faith of the Christian law’, and the names of Tsars, Emperors and Empresses of the House of Romanov were enumerated. After the Liturgy a short service of intercession to the Holy Royal Martyrs was celebrated: to Tsar Nicholas II, Tsarina Alexandra and the Royal Children, Alexey, Olga, Tatiana, Maria and Anastasia. His Holiness Patriarch Kyrill gave a speech as First Hierarch to those who took part in the service. This was followed by a procession to the Cathedral of the Archangel Michael – the burial place of many rulers of Russia, including Romanovs. A short memorial service was celebrated in the Cathedral for the repose of the souls of Russia’s rulers, ‘buried in this place of repose and elsewhere’ with the enumeration of the names of rulers from the House of Romanov. (Report from the Press Service of the Patriarch of Moscow and all the Russias). The procession to the Cathedral of the Archangel Michael was accompanied by ‘the solemn ringing of bells’, a peal used for processions. After the short memorial service in the Cathedral a triumphal royal peal of bells was performed – revived by the bell-ringers of the Kremlin and the Cathedral of Christ the Saviour on the basis of the peal of bells in the coronation scene in Musorgsky’s opera ‘Boris Godunov’. It was performed on the bells of the first, second and third stages of the bell-tower of Ivan the Great, using the ‘Reut’ bell, which hangs in the Dormition belfry. The ‘Reut’ is the oldest 1000-pood (over 16 tons) Russian bell, and was cast in 1622 by the master-founder Andrei Chokhov. The inscription on the bell mentions Tsar Michael Feodorovich Romanov and his father, Patriarch Philaret Nikitich Romanov. This entry was posted in Russia, Russian Church, The Romanovs and tagged Restoration, Romanovs on March 10, 2013 by Father Andrew. This entry was posted in Catholicism, Europe, Orthodoxy, Russian Church and tagged Catholicism, Russian Metropolia on March 7, 2013 by Father Andrew.